Subjectively, a new generation of youth is getting interested in socialism because capitalism’s inhumanity and exploitation does not offer it a better future. The Me Too movement challenging sexual abuse is growing among women around the globe and targeting the abuse of women in government, all fields of work, and the family. The Black Lives Matter movement which emerged in the U.S. in response to state-sanctioned police murder and abuse of Black people has struck a chord internationally. There is no lack of popular protests and strikes around the world, from Sudan, Algeria, Iran and Palestine to Europe, and from China and India to Latin America, Haiti, and the U.S. However, some of these struggles are being crushed by various authoritarian and imperialist forces, and others face the danger of right-wing populism. 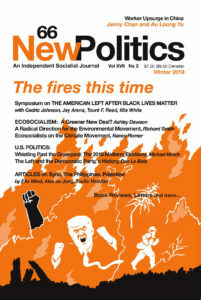 Schulman, Jason, New York City Democratic Socialists of America, U.S.
‹ Can the Military Be Reformed?